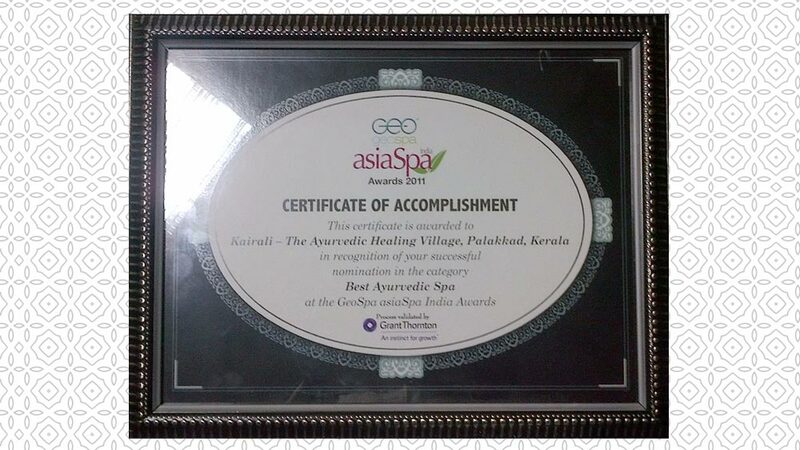 We proudly acknowledge that Kairali – The Ayurvedic Healing Village, Palakkad, Kerala, has been nominated in the category of Best Ayurvedic Spa in the GeoSpa AsiaSpa India Awards, 2011. The Geo Spa Asia Spa Awards are hailed as the highest honour in the field of wellness and health. GeoSpa AsiaSpa Awards India is one of the most esteemed and sought after awards that is given in recognition for distinction and excellence in the spa and wellness industry. The Awards are given to various categories to recognize, encourage and admire the outstanding achievements of individuals and association who have made significant contributions in the health, wellness and fitness industry. The GeoSpa AsiaSpa Awards audited by Grand Thornton sets a benchmark for uniqueness and acknowledges the finest individuals and centres of the wellness industry. It is a matter of delight for us that Kairali – The Ayurvedic Healing Village has been nominated for such an esteemed award. This highlights the fact that Kairali truly upholds its belief that spa is wellness in its purest form.